I live in the most boring neighborhood in Paris, but that doesn’t mean there’s nothing going on. My little street, Christmas Eve or so. The 15th arrondissement, where I live when I’m in France, is so boring that it typically doesn’t show up in guidebooks for tourists. A friend, Paris born and raised, once said this to me about the 15th: the rest of us don’t even think about it. And yet: one of the things that makes Paris what it is to me is that anywhere you go, there’s a story. This morning on the way to the metro, I heard music and turned to see a taxi driver waiting at the stand–playing an electric guitar in the driver’s seat. Further down the block from my apartment is a little park. There used to be a château there, but after the revolution of 1789 it got turned into a gunpowder factory, and early one morning, it blew up. There were surprisingly few casualties–about a hundred–but they say that people found bits of clothes and body parts across the Seine in what is now the 16th. Continue down the street and you get to the Dupleix metro station. It’s on the number 6 line, which follows one of the old city walls, and right outside the exit of the metro station was, for a long time, the place where you got taken to face the firing squad. Turn left and you’ll soon find the rue du Commerce on your right. The famous British author George Orwell washed dishes there before he became a famous British author–if you are a Parisophile and you haven’t read his book about that time of his life, Down and out in Paris and London, you really should. And, although it would be tough to get further from an haute couture neighborhood than mine, this morning I was treated to the sight of a little old lady coming down the street in a full-length leopard skin coat. Matching high-heeled leopard skin boots. Oh–and matching leopard skin shopping bag. Indeed, there’s a story everywhere you go in this city, and sometimes that story is personal. The 16th arrondissement (where the body parts landed when the gunpowder factory blew up in the 15th) really is the most boring arrondissement in Paris, but I never mind going there, because it’s where my grandfather lived. I edited just a bit what my Paris-born-and-raised friend said. What she really said was this: people who live in the 15th love it, but the rest of us don’t even think about it. She’s definitely right about one thing–those of us who live here love it. Party at my place Saturday night! Show up at 8…means that you should arrive at my house at 8. My dog ran off last night, but thank God, he showed up on the back porch this morning, smelling like a garbage dump and looking pretty pleased with himself. I was freaked because I lost my wallet, but then it showed up on my desk. 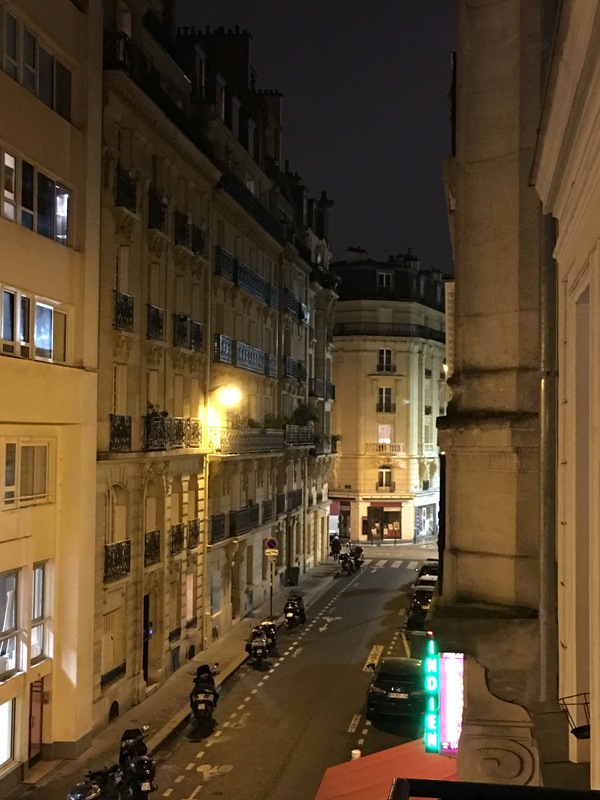 How it was used in the post: The 15th arrondissement, where I live when I’m in France, is so boring that it typically doesn’t show up in guidebooks for tourists. I don’t understand how someone can be born and raised In Pennsylvania but hate the steelers. The north trash. I thank God everyday that I was born and raised in the south. How it was used in the post: I edited just a bit what my Paris-born-and-raised friend said. What she really said was this: people who live in the 15th love it, but the rest of us don’t even think about it. She’s definitely right about one thing–those of us who live here love it. le parigot/la parigote: Parisian. Pejorative. I wear it with pride. très 16e: “very 16th”–in English, we would probably say “bouge,” or “boozh,” or something. Lovely vignettes from your quartier …. living anywhere tends to take the scales off the eyes and suddenly, rather like a pregnant woman who finds the whole world is full of pregnant women she had previously never noticed, your surrounds are full of detail and interest. I’m disappointed the leopard lady wasn’t wearing a leopard bonnet with ears intact!